We have a fresh month ahead of us, and to me the correct way to start a month is having some fresh beer to match. I don’t know about you, but I’m ready to turn over a new leaf this fall by forgetting the candy coma I endured earlier this week… that was rough. Is a candy coma a medical condition? If so, I had it and I didn’t even trick or treat. Chuck that leftover candy (if you even have any) and pour a fresh beer instead. 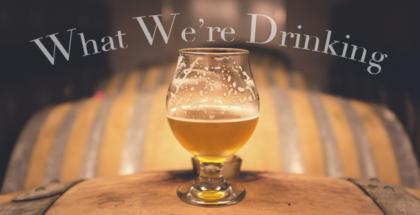 We have some great options from the PorchDrinkers this week, so scroll down to see What We’re Drinking. This one was a treat. @oredockbrewing Fresh Coast IPA is a Belgian-take on the style, with big tropical fruit aromas of passion fruit and pineapple up front, with clove in the background. On the palate the clove is more assertive, along with creamy mango and some underlying citrus bite. A creamy mouthfeel matches the flavors. I could drink this all day. Spooky beer time with @stelmobrewing Fresh Hop IPA! Brewed with Amarillo hops, perfectly balanced flavorful.